Pfleiderer has been very successful as a shipbuilding supplier for years now. Closeness to customers, a distinct understanding of the special requirements of the industry and of course the ideal range of decors and materials is what makes the Pfleiderer team such a valued partner. Now the Hurtigruten fleet is relying on Pfleiderer products to fit out its flagship, the MS Roald Amundsen. This ultramodern ship stands out with its new, environmentally responsible and sustainable hybrid technology and will be launched in 2019. 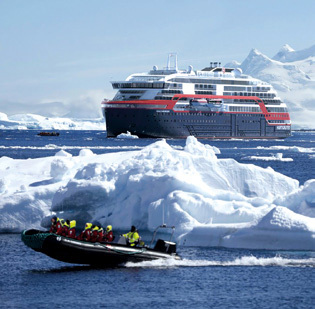 The MS Roald Amundsen is the first of two hybrid ships that will be extending the Hurtigruten fleet in the years to come. The combination of an advanced hull design and efficient use of electricity on board allows the hybrid technology to reduce fuel consumption and CO2 emissions by 20%. The construction of these two ships is the largest single investment in the history of the Hurtigruten company. Pfleiderer is providing the material for the furniture and wall coverings as part of the interior fitting, which began in 2017.